Forest fires raging in Spain's north-eastern Catalonia region have left three people dead, officials say. Two French nationals drowned in the sea close to the border with France while trying to escape the flames, Catalonia's interior minister said. Strong winds gusting up to 90km/h (55mph) have rendered one fire "out of control", he said. 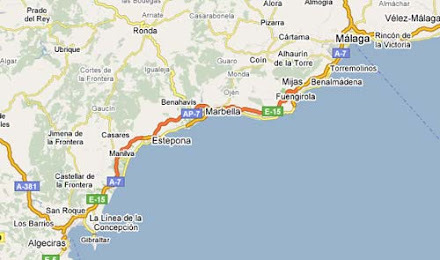 All residents of the county of Alt Emporda - about 135,000 people - have been ordered to stay indoors. The area is a main link for holidaymakers travelling to and from southern France. Traffic on the cross-border AP-7 motorway was reported to have been severely disrupted on Sunday. The two French victims were among several people who were trapped by fire as they travelled along the N-260 main coastal road near the town of Portbou and tried to reach the sea by climbing down cliffs, according to Catalan Interior Minister Felip Puig. The victims were a 60-year-old man and his 15-year-old daughter, Spanish media reported. A 75-year-old man died after suffering a cardiac arrest in Llers, north-west of the area's main town, Figueres. At least another 19 people have been wounded, including a French national who suffered burns on 80% of his body when he was caught in his car by the flames. The fire near Portbou has been brought under control, according to media reports, while a much larger blaze further inland, around the border town of La Jonquera, was still spreading late on Sunday, Felip Puig said. 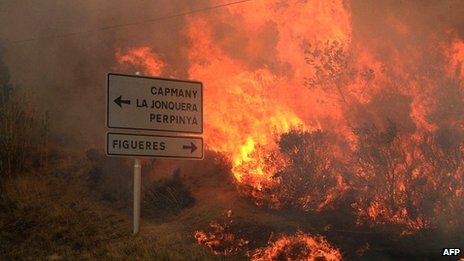 The fire, travelling at about 5-6km/h, came within 10km of Figueres, Mr Puig said. A total of about 13,000 hectares (32,000 acres) of forest are estimated to have been devastated in the area, according to the authorities.